Both my mom and my mother-in-law are big fans of Ree Drummond and The Pioneer Woman cooking show on Food Network. We’d been to Ree’s new Mercantile store and restaurant in Pawhuska twice this year, and when we returned home from our last trip, we could tell that both our moms were itching to see The Mercantile for themselves. 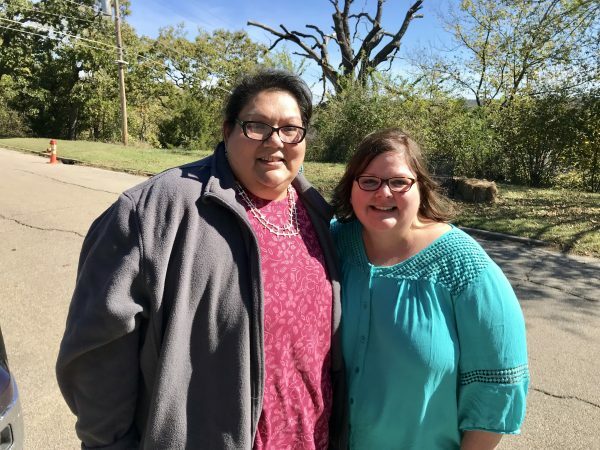 So, we planned a third trip to Pawhuska to show our moms the town and introduce them to the only chicken fried steak we’d admit was better than theirs. Our moms relax for a minute on a Pawhuska bench. Our first stop, after a getting a cold fountain pop at Handy’s, was the Pawhuska Chamber of Commerce. We introduced our moms to Joni and Reba and got some ideas for things to see and do while we were in town for a few days. We checked into our Airbnb house called Redbud Cottage and got settled in this wonderful three bedroom, two and a half bath house. It had a huge kitchen with complimentary coffee and more space than we really needed. 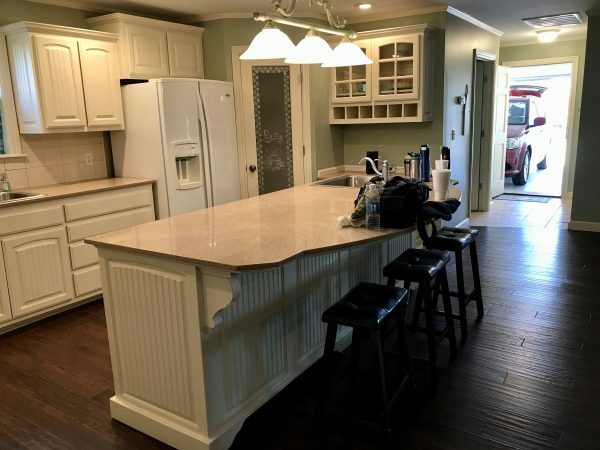 The Redbud Cottage has a large modern kitchen available to people staying there. 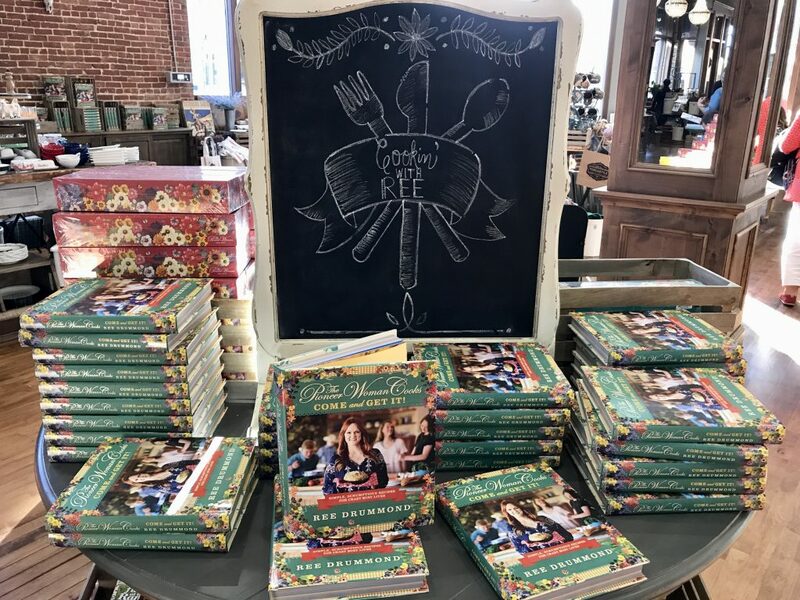 After unpacking our bags, we headed downtown to The Mercantile where our moms had a great time shopping and buying Ree Drummond’s newest cookbook, “Come and Get It,” which was released for sale that day. 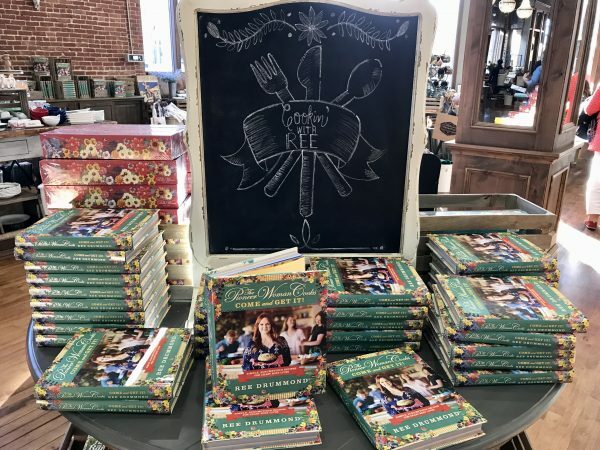 The Pioneer Woman Cooks, “Come and Get It” cookbook. 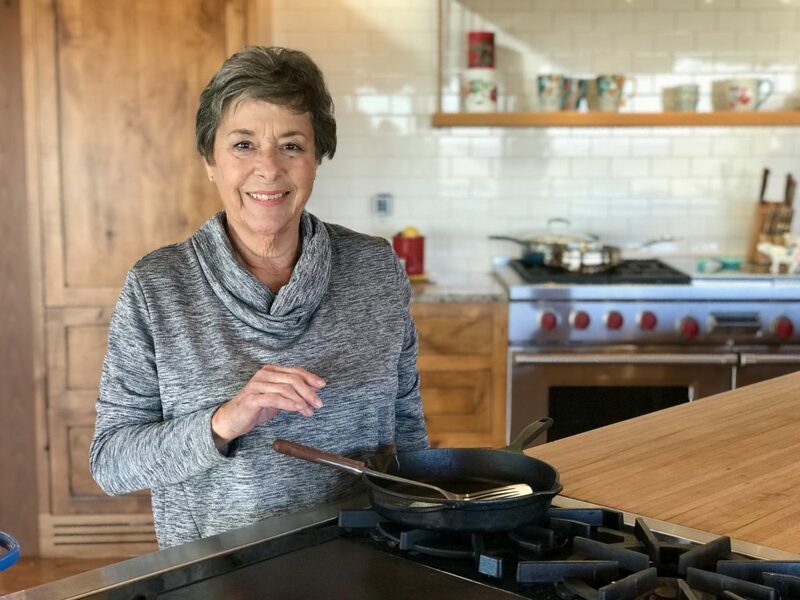 My mom is a Weight Watchers leader and just loved this tiny plate that should help with portion control. Gayle bought several gifts for friends and we all left with one of the greatest plastic wrap dispensers we’ve ever found. 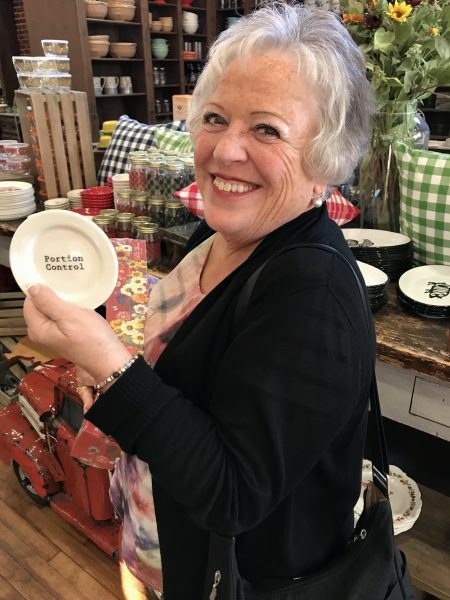 Carol found a plate at the PW Mercantile that’s perfect for those wanting to control portion size. We enjoyed a lovely dinner (with no wait) at The Mercantile, including queso dip, chicken fried steak, pork chops, and a salad. 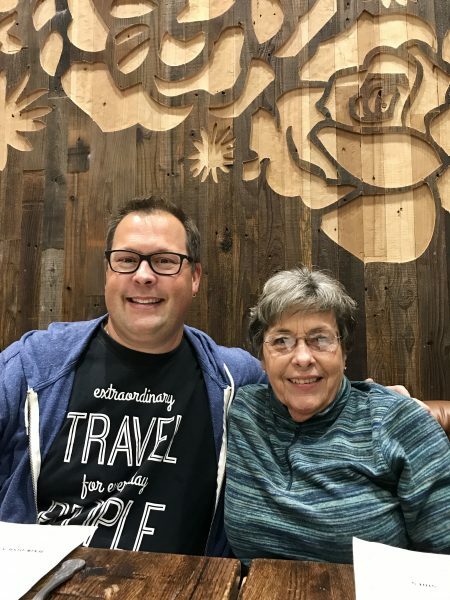 Steve and his mom anticipate dinner at the PW Mercantile Deli. With Ree in New York City promoting her new cookbook, Ladd was at the restaurant for dinner that night and was gracious to take pictures with people as he waited for his meal. 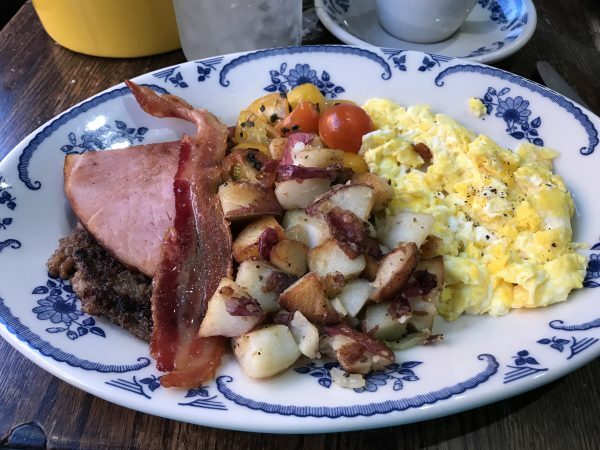 The next morning, we headed back to The Pioneer Woman Mercantile for breakfast, our favorite meal of the day. We sipped coffee and enjoyed a relaxing meal, including cooked-to-order eggs, three types of pork (ham, bacon, and house made sausage), homemade biscuits with jam, and a side of buttermilk pancakes with four types of syrup. The Farmer’s Breakfast offers a sampling of many favorites. 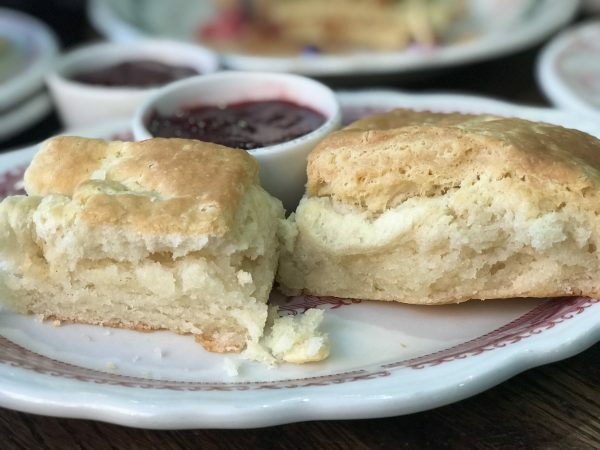 Buttery, light, and flaky don’t begin to do these biscuits justice. 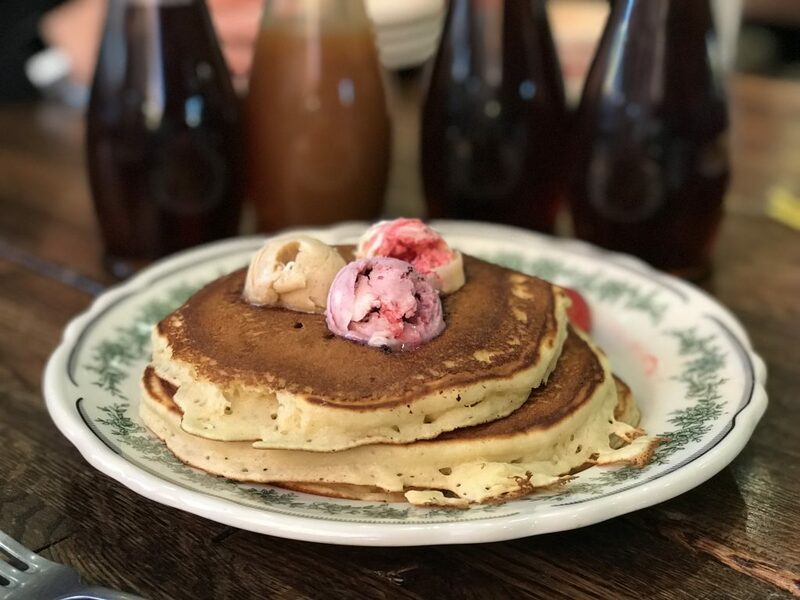 With three different kinds of butter and four kinds of syrup, Edna Mae’s Pancakes at the Merc taste even better than they look. Needless to say, we were not going to need lunch that day. After breakfast, we headed out to the Drummond Lodge where Ree and Ladd had generously opened up their guest house to visitors. 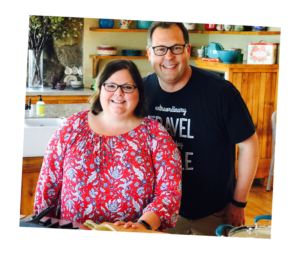 We were able to take a self-guided tour around the lodge, stopping to play kitchen where Ree often films here Food Network show. Gayle had fun being in the place she’s always enjoyed seeing on TV. 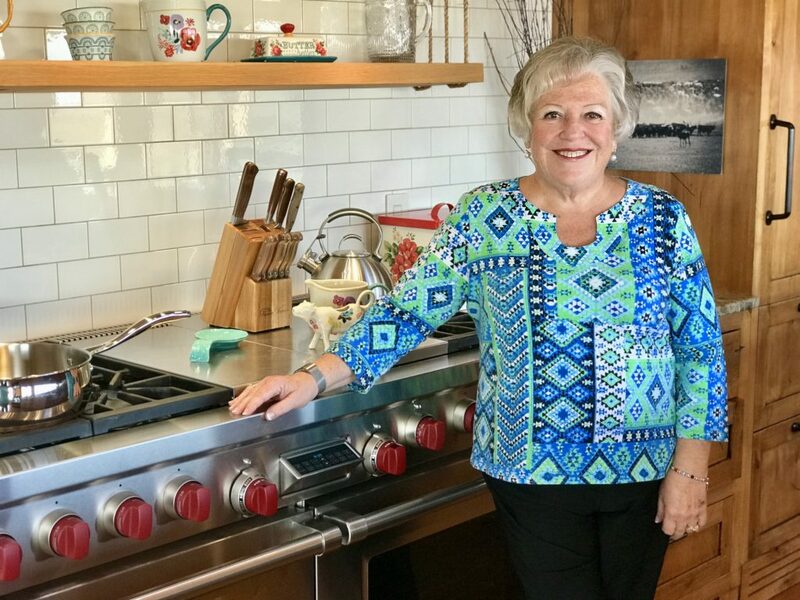 Having watched The Pioneer Woman TV show for years, it was so much fun to see our moms in that space, reminiscing about seeing this or that on the show. Carol has seen this stove in action on TV many times, and enjoyed checking it out for herself. 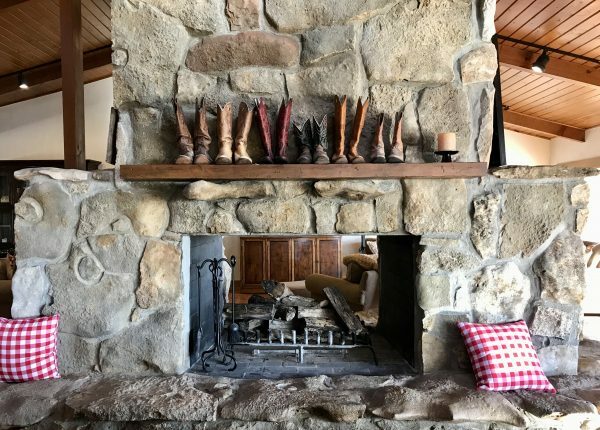 We walked around the lodge together, admiring the cozy living room, the boot-lined mantle, and the enormous pantry. This boot-lined mantle was picture perfect. 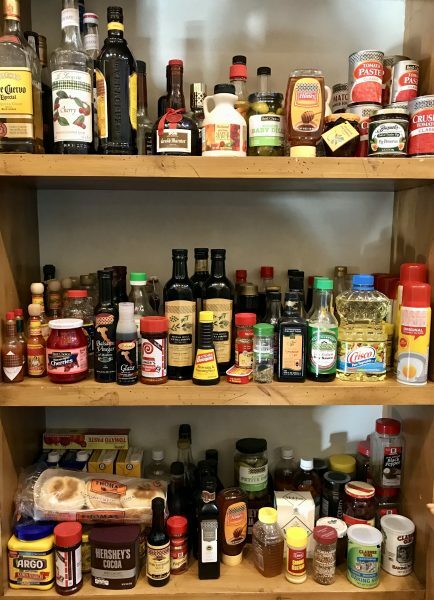 The pantry at the Lodge is well stocked with anything Ree might need for a recipe. This is one of several sets of shelves there. 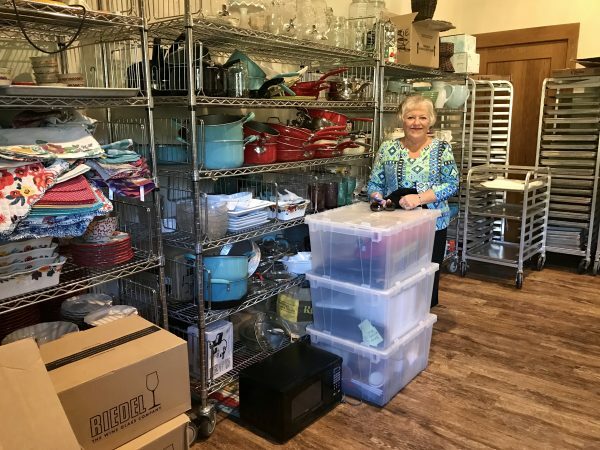 Carol couldn’t believe how many pots and pans there are in the back pantry at the Lodge. 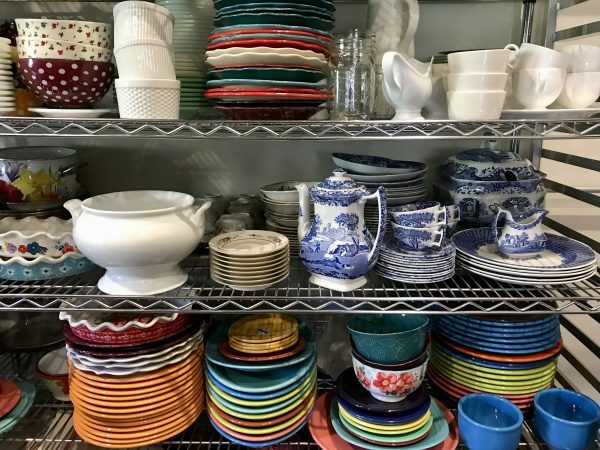 Stacks of dishes line the shelves of the pantry in the Lodge. Before leaving, we enjoyed the view from the deck at the lodge and checked out the outdoor grill on which we’d seen Ladd and Ree cook the perfect beef steak. 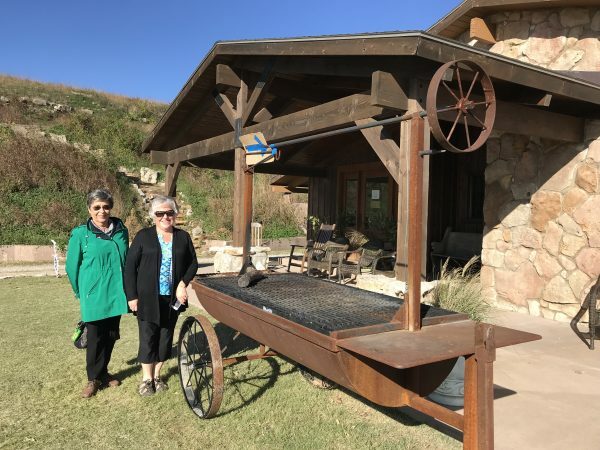 Gayle and Carol have seen many episodes featuring this grill that sits outside the Lodge. Our next stop was at one of our favorite places in Pawhuska — the Immaculate Conception Catholic Church. This local church houses some of the most beautiful stained glass windows we’ve ever seen. 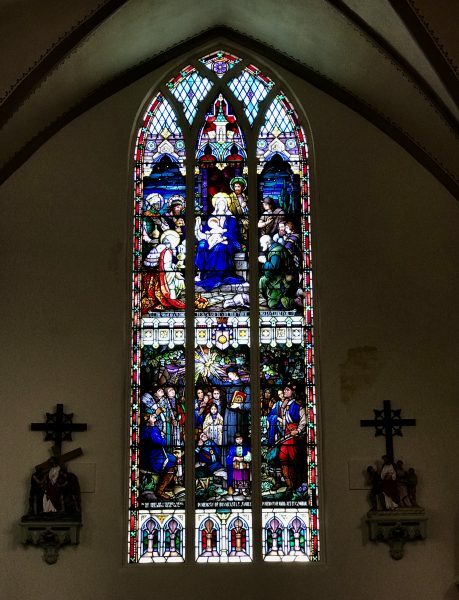 The Osage Window in the Immaculate Conception Catholic Church is simply spectacular. 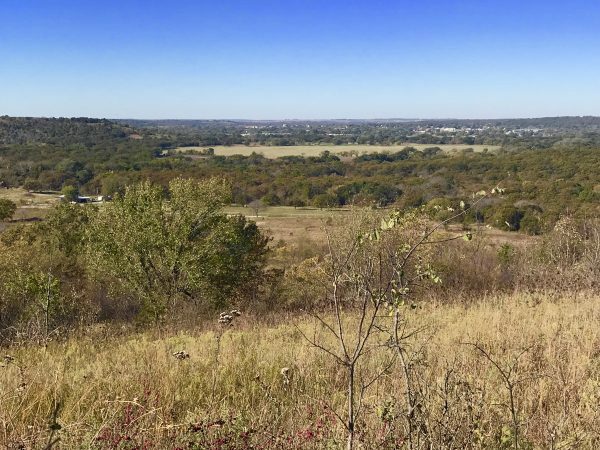 The most famous window shows Father Shoenmaker bringing Catholicism to the Osage people. To even be created, the window required special dispensation from the Pope because it depicts people who were alive at the time it was made. Next stop was the Osage Nation Museum. I’d been there a few weeks ago, so Steve took our moms inside and I was planning to go visit someone who lived close by. I never made it across the street because just as I got out of the car, a woman in a truck drove by rolled down her window to say, “Are you that blogger lady?” It was Margie Williams, one of the contestants (and winners) from the National Indian Taco Championship we’d judged a few weeks earlier. 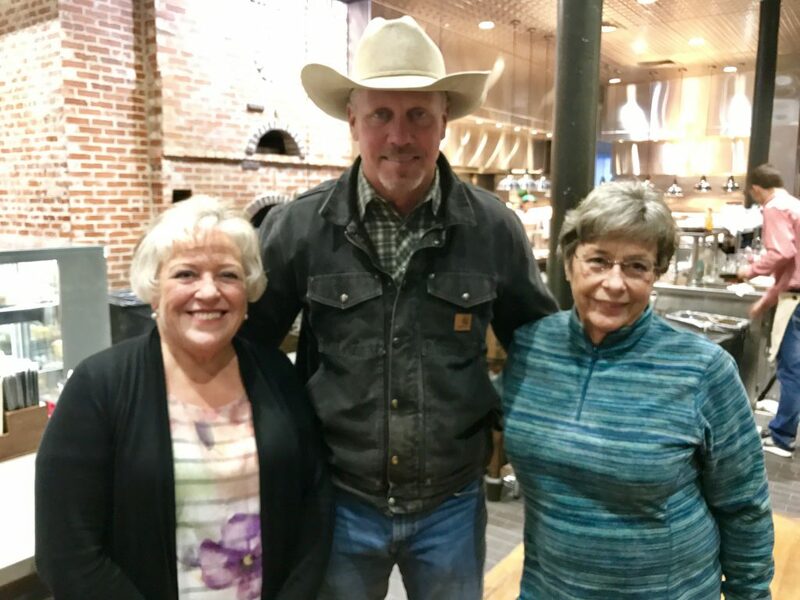 Ann had a great time catching up with Margie Williams while we were in Pawhuska. We had such a nice visit and she gave us a few more ideas of things to see and do in Pawhuska. Before we knew it, Steve and the moms were back from the museum and it was time to head back downtown. 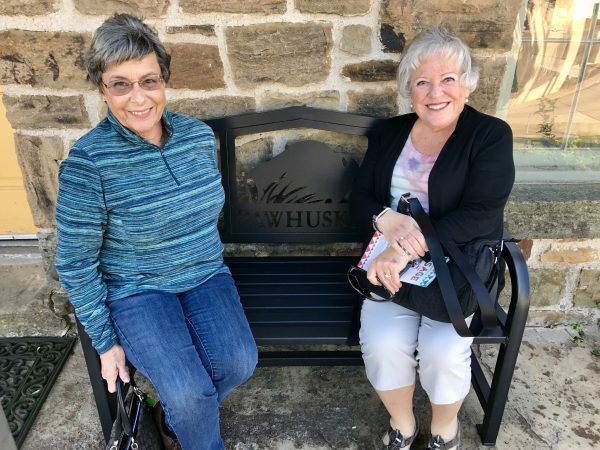 We dropped my mom and Gayle off at Roaming the Osage Historic/Scenic Tours, where they spent the next 90 minutes touring Pawhuska and seeing the Tallgrass Prairie Preserve, The Grandview Inn B&B, and learning about the history of Osage County. All settled in and ready for the tour! The next morning, we took one of Margie’s suggestions and went up to Lookout Mountain where we had an incredible view of Pawhuska and visited the gravesite of Chief Fred Lookout and his wife Julia. 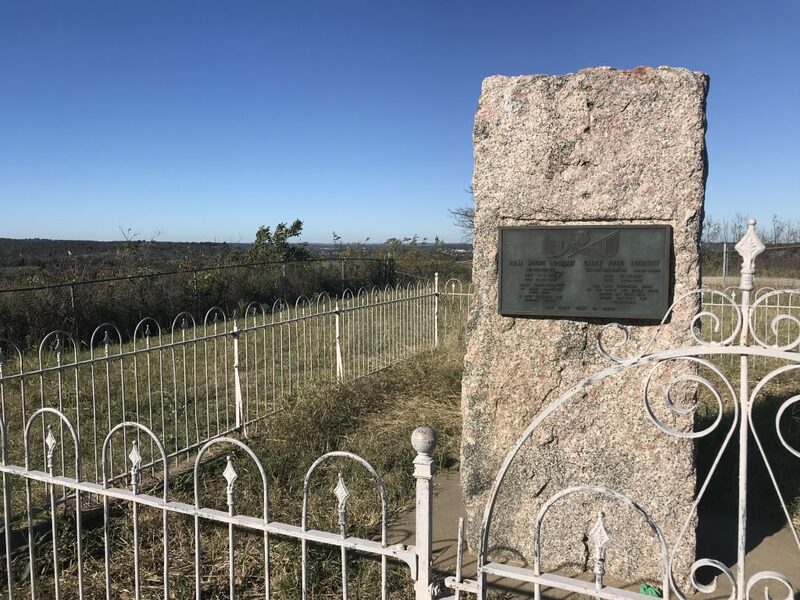 The grave marker of Chief Fred Lookout and his wife Julia sits atop Lookout Mountain. 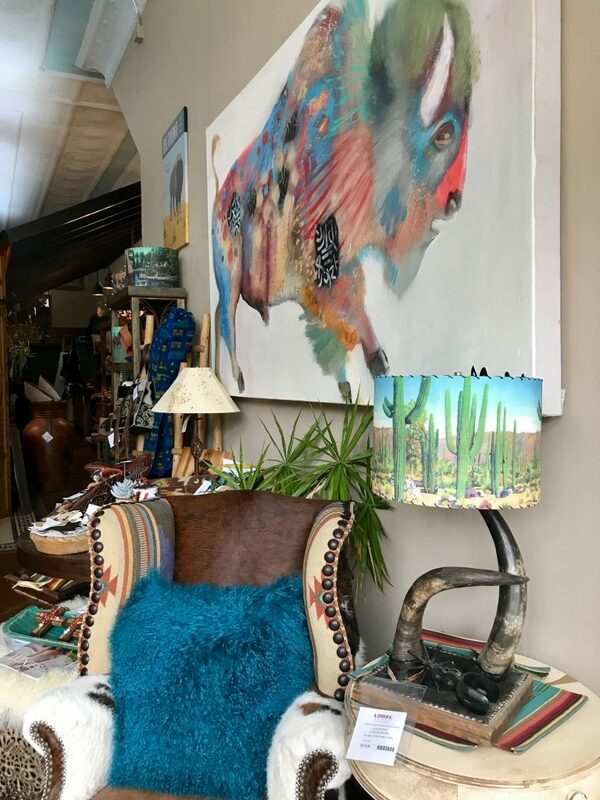 We spent time in some of our favorite shops, including Buckin’ Flamingo, Mudpies, Salt Creek Gallery and Marketplace, LOREC Ranch, and Osage Outfitters. 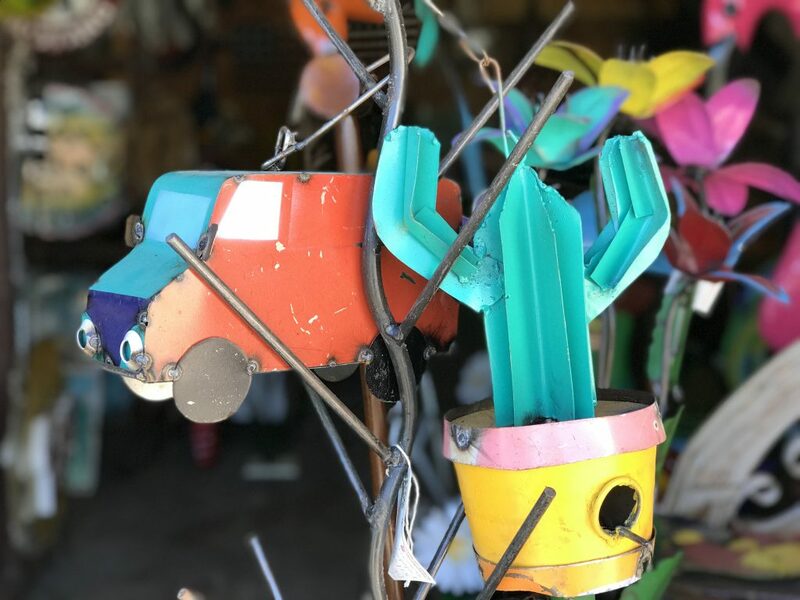 Some of the fun merchandise available at the Buckin’ Flamingo. 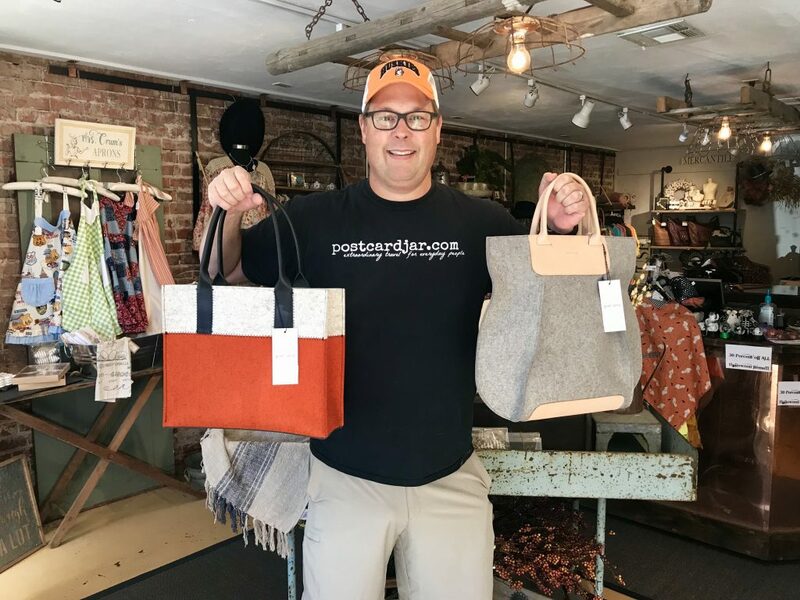 Both Ree Drummond and JoAnna Gaines carry one of these bags. 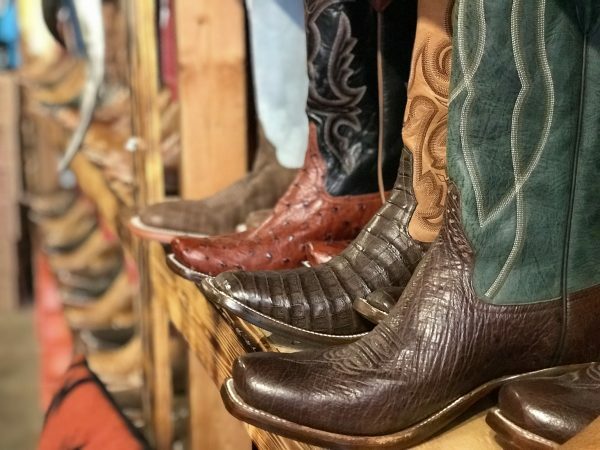 Some of the unique boots available at Osage Outfitters. 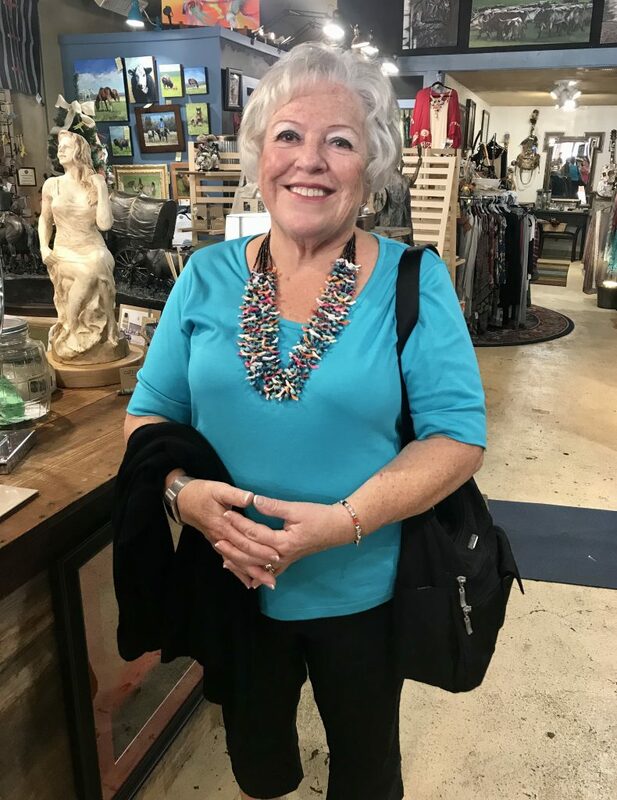 Both of our moms loved Tallgrass Art Gallery, and my mom decided to splurge on a fetish necklace that she wore out of the store. 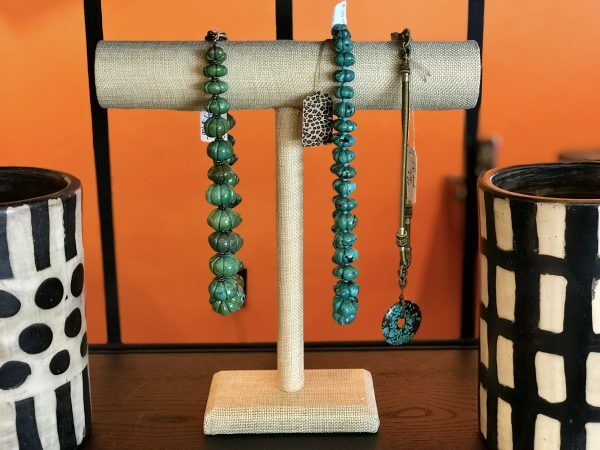 Carol bought a unique necklace for herself at the Tallgrass Art Gallery. 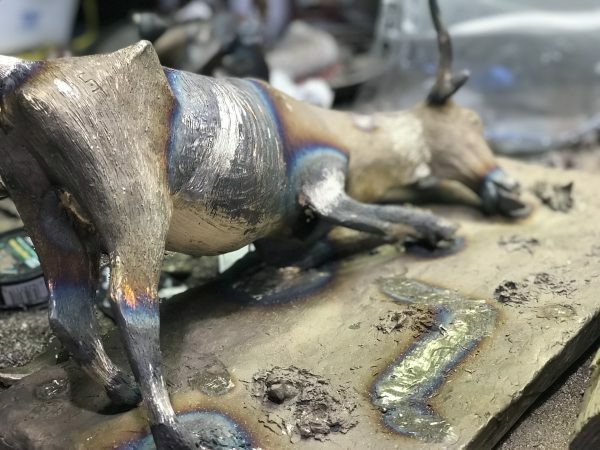 Before calling it a day, we had a chance to have a private tour of the Bronze Horse Foundry, which was absolutely amazing. 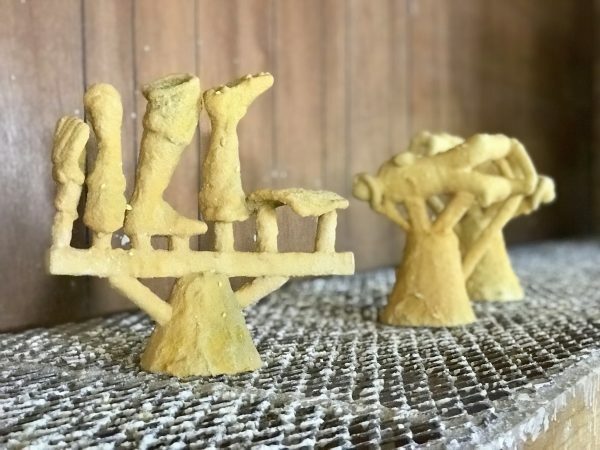 Cindy Free showed us the extensive processes used to create bronze sculptures. It was so interesting and we were so grateful for the time she spent showing us around. 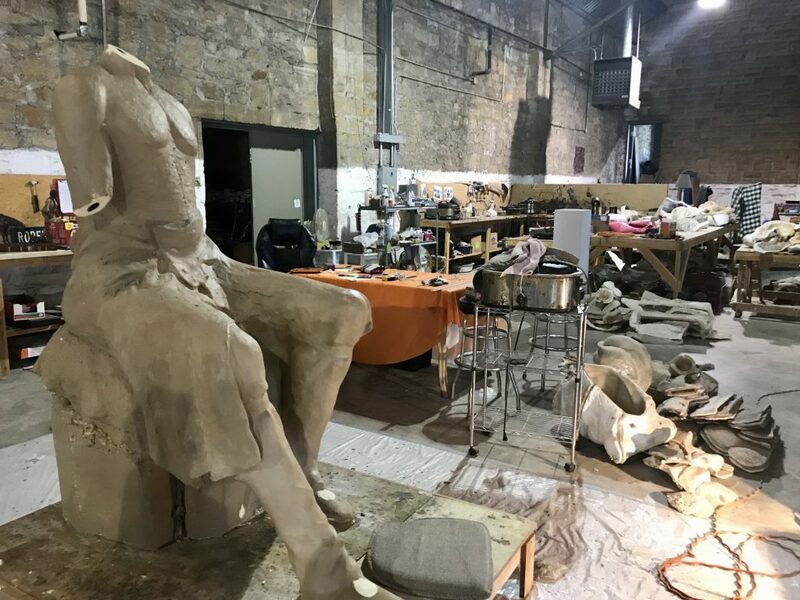 A statue begins to take shape at the Bronze Horse Foundry. 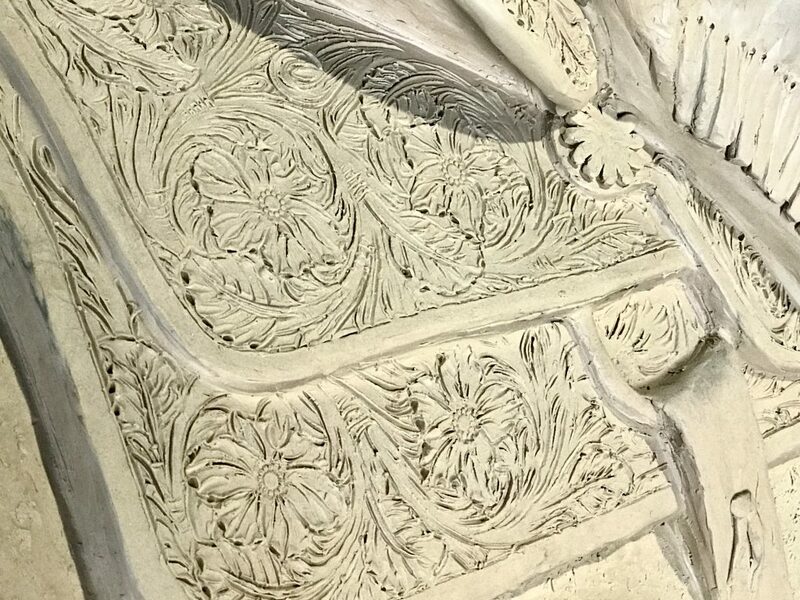 These ceramic shells are almost ready for molten bronze. All of the fine details the artist puts into the clay will appear in the bronze when it is complete. Workers at the foundry work to finish this bronze casting. 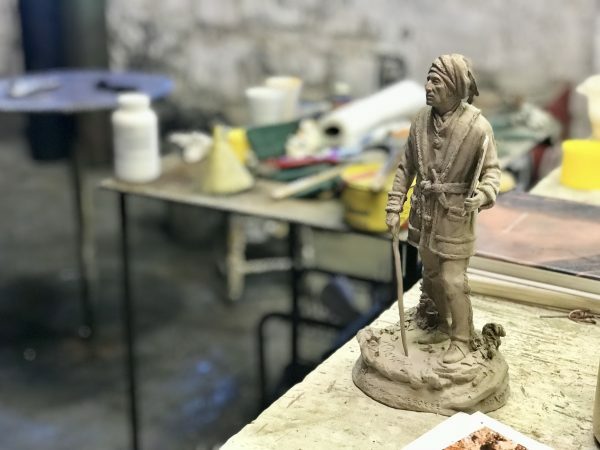 This clay figurine is ready for the next step in casting it as a bronze. Our last stop of the day was at the legendary Swinging Bridge, just a few blocks away from The Mercantile. 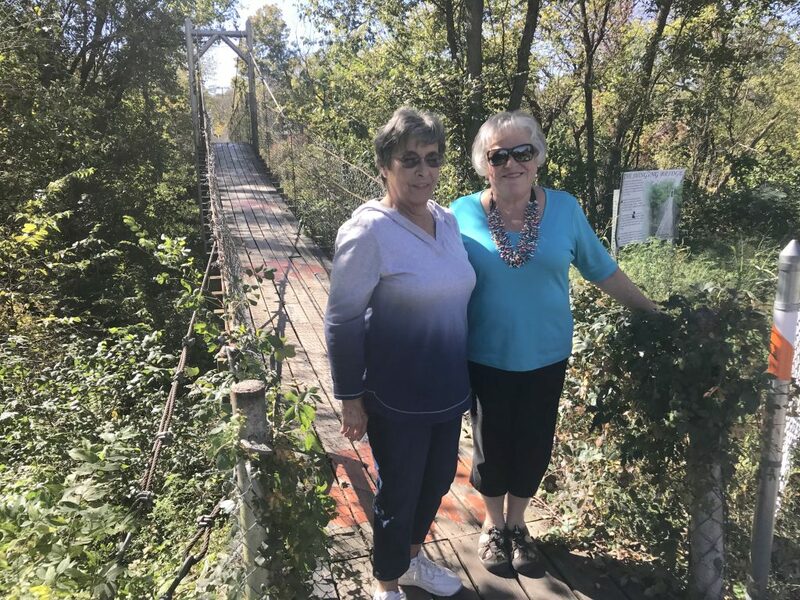 We’d braved a walk across the suspension bridge on a past visit and were sure we’d convince our moms to do the same. We sensed their hesitancy and pleaded with them to walk across, but they just weren’t having it. We could get our moms onto the end of the swinging bridge, but no further. The looks they gave us said it all. “Because I said so.” We love our moms very much, and we know not to argue with that. 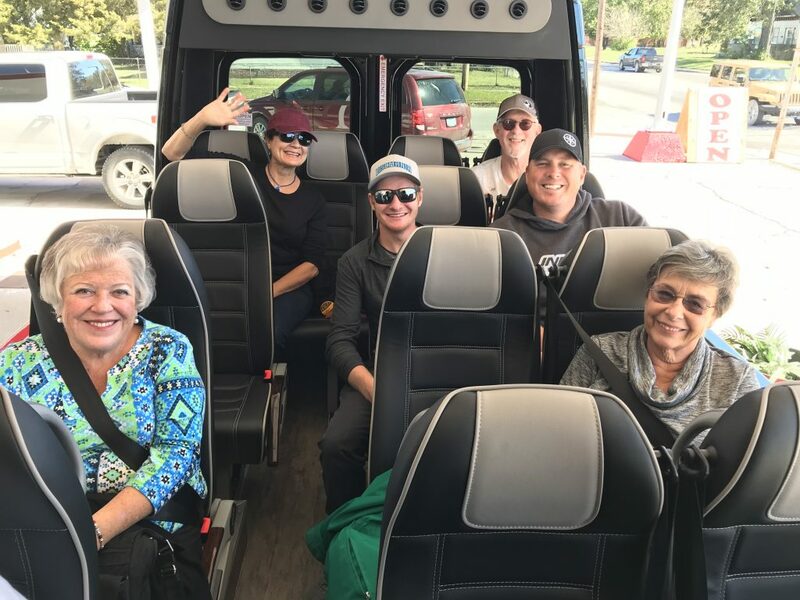 Have you taken a mother/daughter or mother/son trip? Where did you go and what did you enjoy most about it? Let us know, we’d love to hear from you. Thanks for all the info about what Pahawska has to offer. It is on my list to visit! We hope you get there someday. It is a wonderful little town. Good for you and Steve, sharing your adventures with your moms! Special times! We had a wonderful time and made many great memories!